My last major project was my story quilt which I finished in April. It was completely absorbing so when I had finished I had a build up of small projects and repairs to do. Projects get thrown to the side when time is short, piling up wherever there’s space in my Woolly Room. 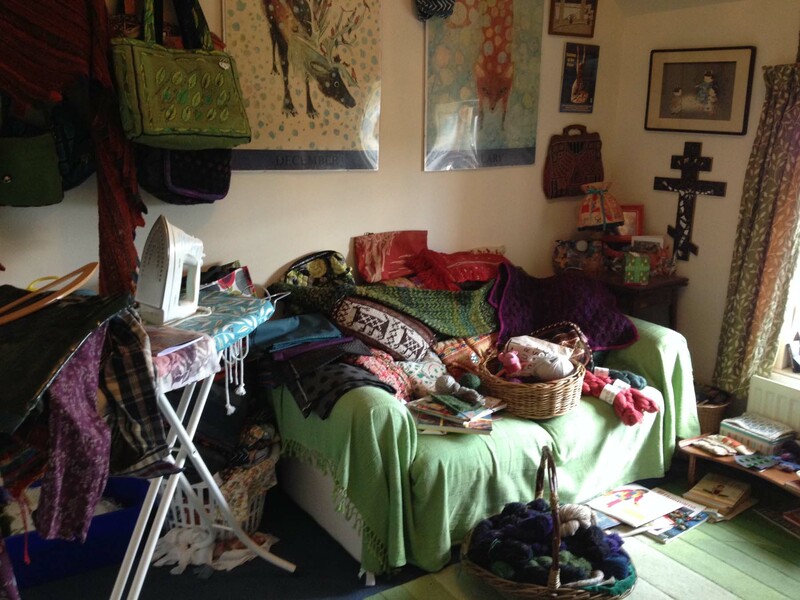 I have a tiny little Woolly Room (so named by my children when they were small…. 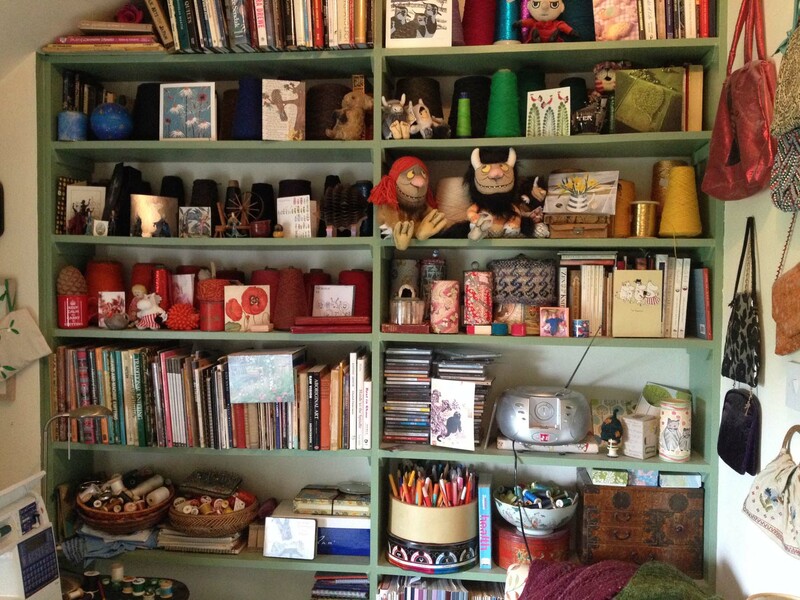 you might guess why from this photo – if you can see the yarn cones for everything else on the shelves.) This post is about clearing the decks before I start another big project. I’ve loved Tin Can Knits’ Old Growth pattern for a long time. It wouldn’t work for me because the button band is off centre (I tend to wear my cardies open and with this cardi, I’d have a lot of fabric hanging free). But I thought it would be a really nice cardi for a friend’s baby. 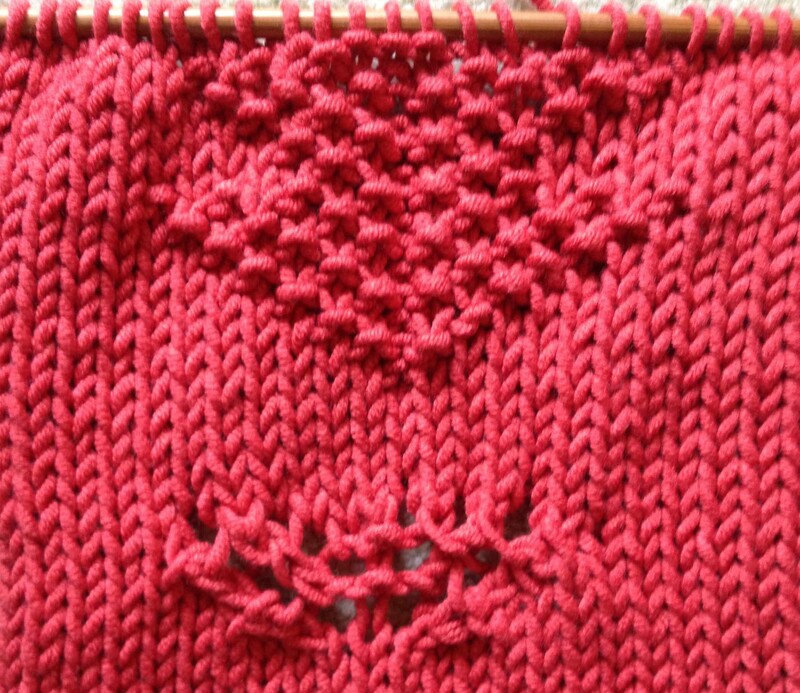 The motif that is such an integral part to this knit, didn’t work with my yarn (Rowan all seasons cotton), so I had to adjust the pattern slightly. You can see below how ridged and gappy the original motif is – I’m much happier with my adaptation above. The yarn came from my stash, as did the ladybird buttons – always a most satisfactory use of existing resources. Can’t wait to see little Maud wearing it. When this little cardi was finished, I had to get something else on my needles quickly for travel knitting. So I started another 3S shawl. This is the first one I have knitted in stripes of different colour. 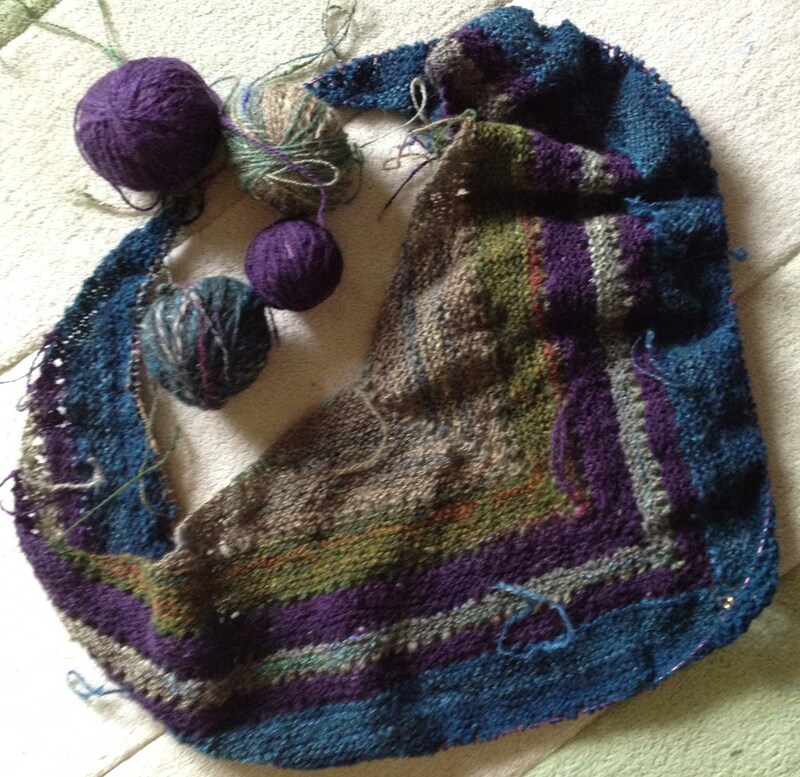 I am using bits and pieces of my homespun yarn, having discovered that I had a lot of bluey/greeny/purple tones that worked so well together. I just love knitting this shawl pattern. I really want to knit it all the time, so have to be strict with myself and only let it come out when I am on the train or in the car. I had a couple of dresses that I wanted to wear now the weather is better. 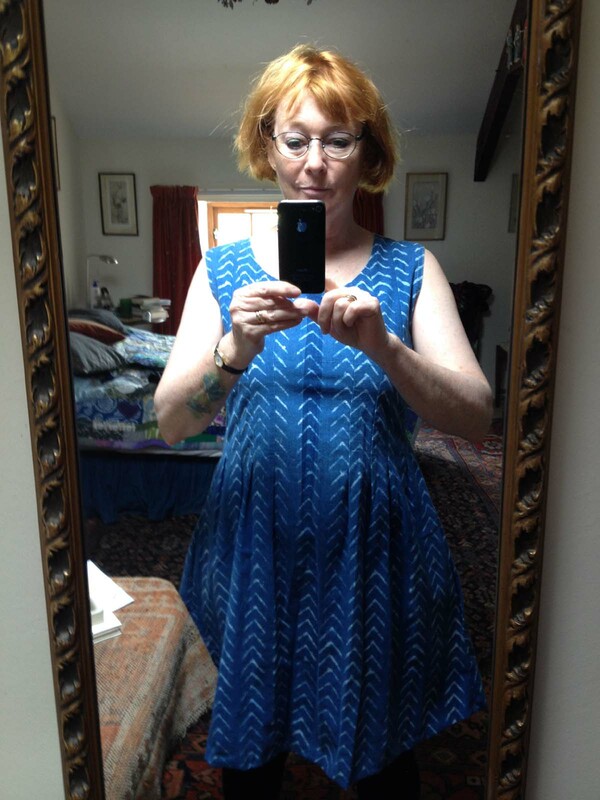 This one came from a local charity shop, and it’s viscose (which I don’t usually wear, and have recently heard terrible stories of viscose which confirm my distaste). However, I love love love the bold fabric pattern, and it has a great hang, so I decided to give it a go. Trouble is, the skirt had been joined to the bodice in the most unflattering way – just gathered and sewn. The pattern is so loud that you may not be able to make out quite what I mean here? 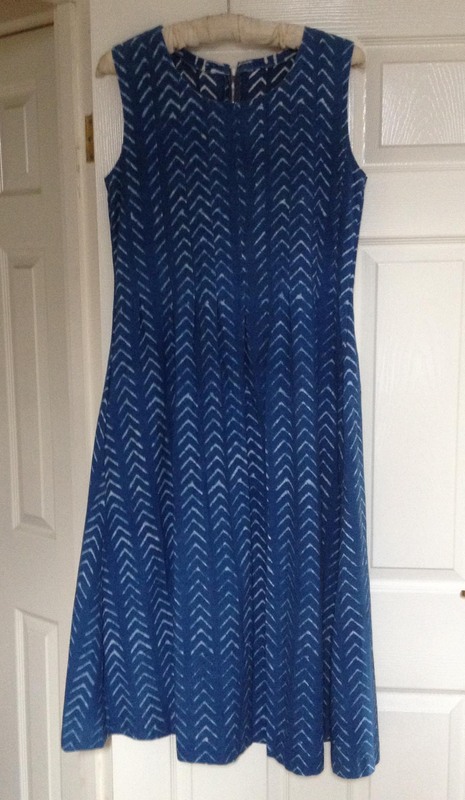 I carefully unpicked the bodice/skirt seam, and re-joined them in the Washi dress style – it is flat across the stomach, with 3 pleats drawing the fabric to the side. Same on the back. To make sure the pleats lay flat (and flattering) I added a (high) waistband inside. I’m not sure you will really see what I’ve taken so much care to do. However, I know it is a great improvement every time I wear it. And we all know that at the end of the day that’s all that matters. This is a beautiful dress I made at least ten years ago. I bought the fabric in Habitat. I don’t know if it is really indigo-dyed, but it gives a very good impression of being hand-printed and hand-dyed. It is a beautiful soft, strong cotton – very comfortable to wear against the body, and with good drape. But it is very long. I used to wear in hot Devon summers when I was much younger. Now I am older and live in cooler Northumberland, the length just doesn’t work. Indeed, the length would be positively maddening in the wind that we can get here. So time to cut it short, much much shorter. Now I’ve cut it shorter, and I’ve also let out the centre seam (you can just see the exposed fabric in the centre is darker). But it is still too tight. Face it, Katherine, it is too small for you to wear comfortably. Over 10 years you have put on a bit of weight…. The answer is to cut down the centre of the dress (sort of like doing one of those scary steeks), and add an extra strip of wider material. Then add some buttons for decoration. But which to choose… just too much choice. 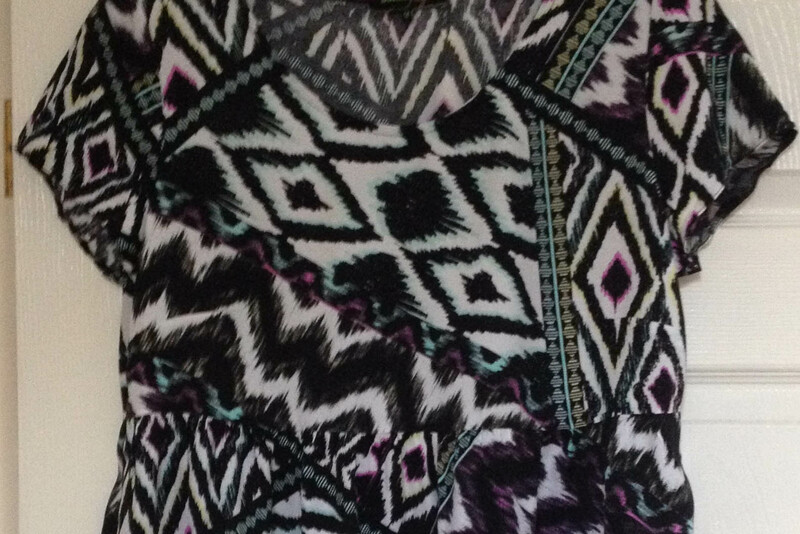 I’m still not sure that I chose the right buttons…or that buttons work on this dress at all. I’ve got a little matching bag which my daughter made for me (one of her first projects when she was a teenager and just exploring sewing machine possibilities). 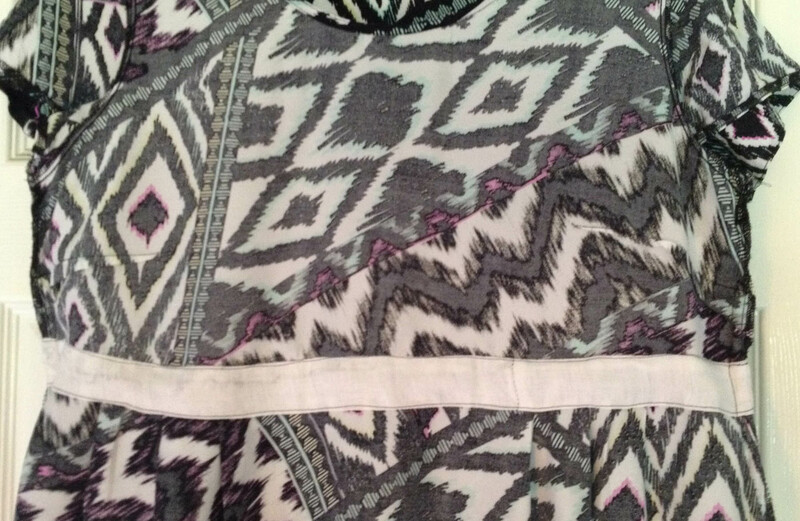 She’s reversed the fabric and got the strong pattern lines running horizontally. 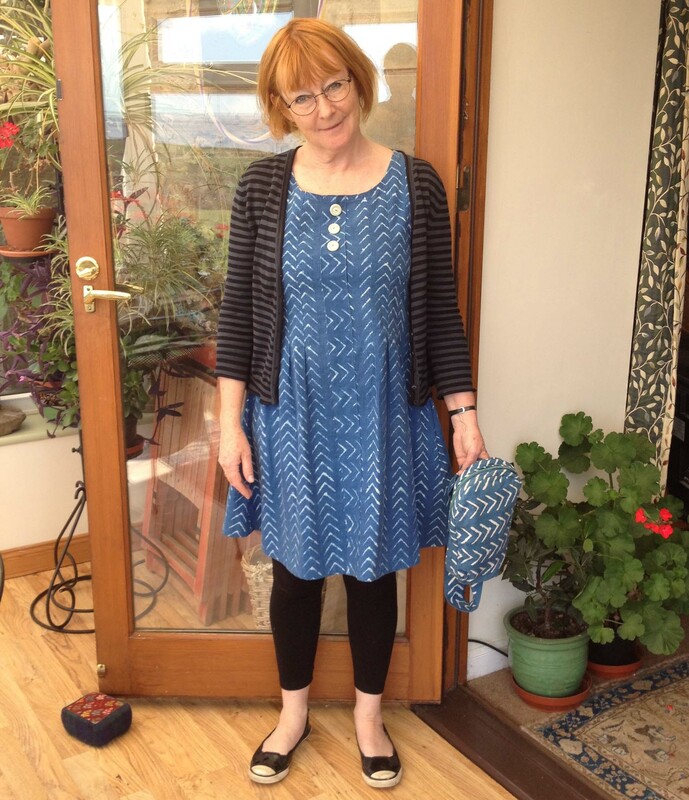 It’s a fab little bag – thank you, Helen! 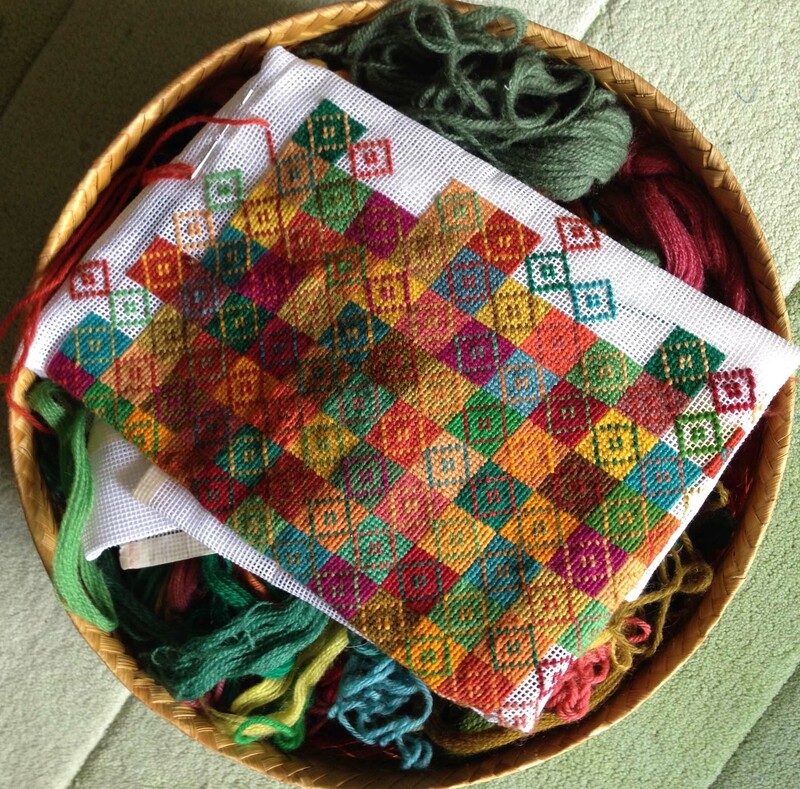 Now for mending – there is always mending to do here! 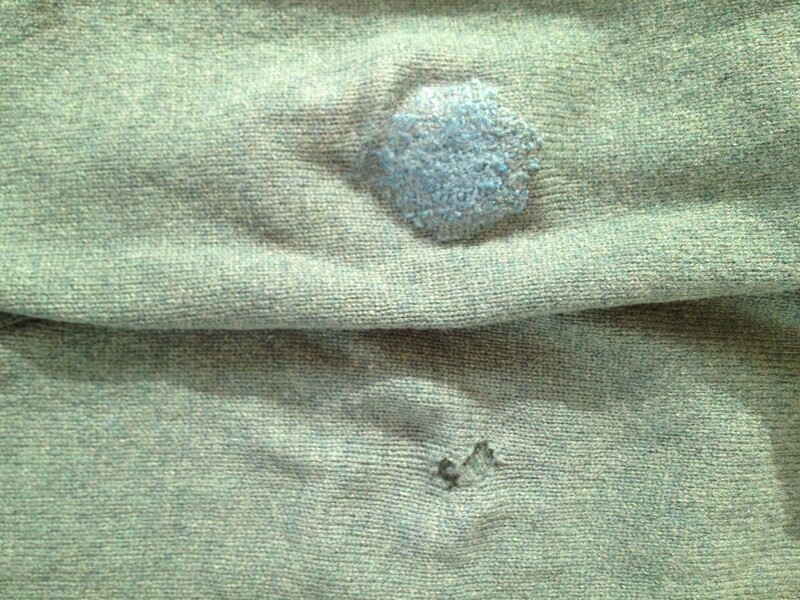 Stephen had worn through the other elbow on his pullover, so that needed darning. And I’ve been renovating my father’s old shopping bag. My father died just two months ago, and my mother has started to give away his things. She thought this was right for me, and it is – just right! Funny how sometimes the most unexpected and ordinary gifts are the best. My father used this bag everyday when he would walk out with his dog and his stick to buy milk, deal with the post and the other everyday things of life. It came to me worn and weary. I’ve recovered the worn handles with new strong fabric, and I’ve added patches to the corners and sides where the bag was getting a bit holey. It’s a plasticised cotton bag, and the iron-on patch material didn’t take very well (I had to be very careful with iron temperature), so some of the patches had to be glued as well. Here’s my new bag, visibly mended, looking great and it gives me such pleasure to use it. Now that all that stuff is finished, I can do something about all those exciting projects I’ve been fantasising about. There’s fleece to be spun. 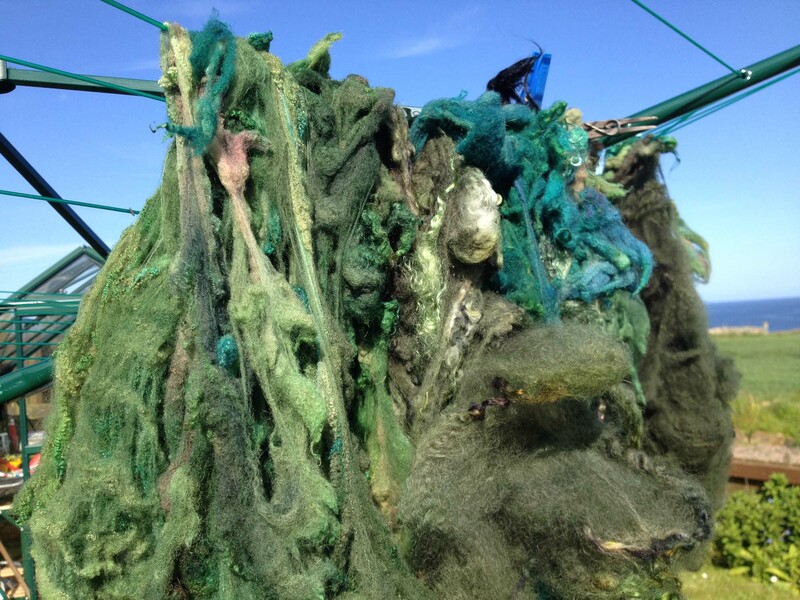 Here it is, freshly dyed and drying on the washing line. I’ve got some tapestry work on the go. And I’ve got some new books to explore. Where to start?! haha, not to make mock but your lovely place looks like mine! 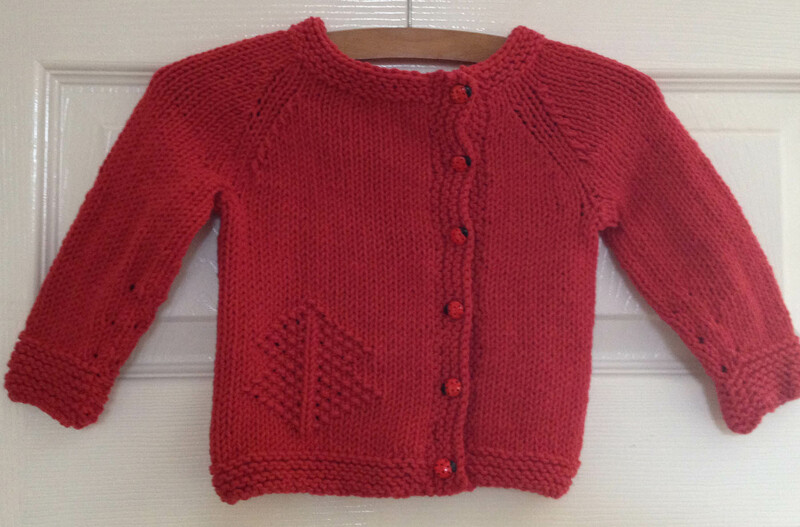 The cardi is very sweet, I do like that pattern, for a child. The shawl has wonderful colours and I do admire you for ‘fixing’ the dresses 🙂 Your Dad’s shopping bag is super! You will enjoy using it, remembering him. 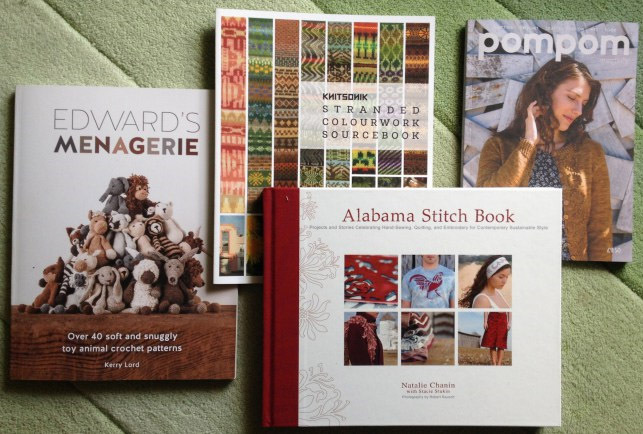 Now, where to start…spinning/needling/reading? It will all be fun. You look great in that blue dress! How nice to know that you’ve got a Woolly Room too. A craftsy person after my own heart. Yes, it will all be fun – you’re quite right! and – thanks for the blue dress compliment! Oh my, you are on fire with this deck clearing business! You made some smart mendings on those dresses, fiddly stuff, but so worthwhile. Totally agree with you about pleats being more flattering than gathers. The shopping bag mend is the corker though…you will be using that and remembering for a long time. Yes – you’re right! 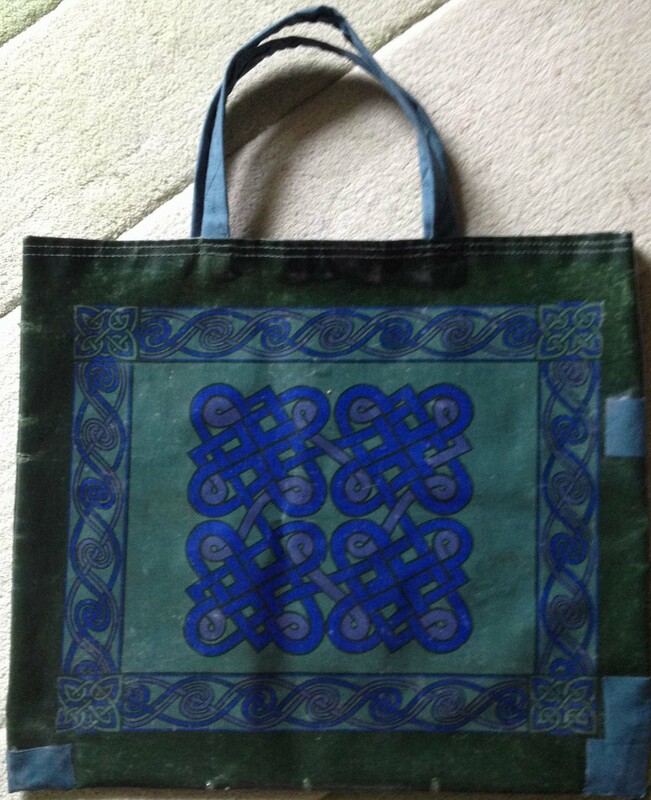 The shopping bag is so special – I am so thrilled to have it, and treasure it so much that I’m a bit reluctant to use it…..which rather defeats the point. You are just SO prolific, Katherine! The blue dress is beautiful, and pictures of you are stunning. Very satisfying finishing up/fixing things. I was so glad to hear your mother thought of the bag for you. Remember these are things I’ve done over several months, Polly – but, yes, I do have a lot of stuff on the go, and always want more time than I have which is ridiculous since I am retired. 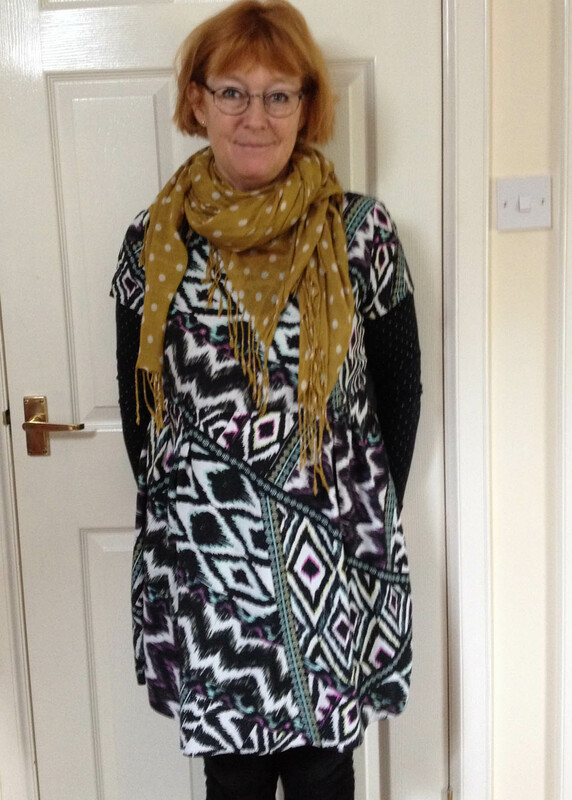 I am really pleased with both dresses, – thank you for your kind comments. 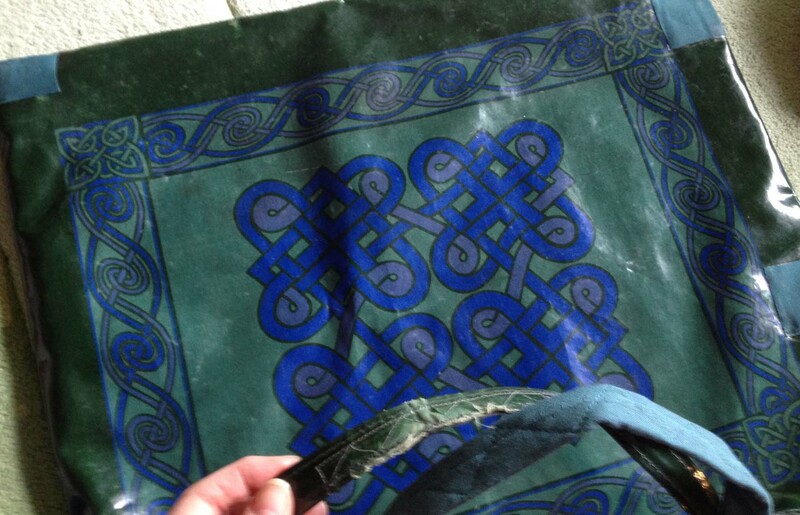 And loving the bag – spoke to my mum today and told her how I had repaired it and she was pleased too.